Together with the Maasai in Kenya and Tanzania, Amref Health Africa has developed an Alternative Rite of Passage for girls to transition to womanhood. While most of the traditional ritual remains unchanged, one important part has changed. Girls no longer experience Female Genital Mutilation (FGM) (also known as Female Genital Cutting or FGC). More than 10,000 girls have gone through an Alternative Rite of Passage ceremony since the first one in 2009. Leah Ntatu, belonged to the first group in her village of Shompole, Kenya, that celebrated an Alternative Rite of Passage in place of FGM. Leah is now one of the few girls who attends high school, a few dozen kilometres from her village. How does Leah look back at the alternative ritual? “It was new then, and not set up as big as it is now. But it didn’t come out of nowhere. Amref Health Africa spent years talking to people in the village, with the village elders, to make them understand the dangers of FGM/C. And they also spoke with the girls, to prepare us for the changes. We are very happy and wanted this change to happen,” Leah says. A parade, a blessing by the village elders and a big party – it’s all part of the graduation ceremony of the Alternative Rite of Passage to become a woman. “My parents were even there,” says Malaso Shinini, with pride. Malaso’s parents fully support the alternative ritual. “Like most other parents in my village,” she says. And that really shows on the festive day itself: the entire Maasai village in Shompole, Kenya turns up to watch the girls get blessed and receive their official diploma. The Alternative Rite of Passage starts with two or three days of sexual and reproductive health education with the girls. “I learned a lot about the dangers of FGM/C. It causes terrible pain and you bleed a lot. Moreover, after you are expected to marry soon. Often to a much older man. While of course it is so important to finish an education.” And Malaso has big plans; she wants to finish school and become a pilot, the first in her village. With 6 wives, 38 children, 150 cows, 60 goats and five donkeys tribal elder Simon Ngushashi calls himself a rich man. Together with his family, he lives in Kilindi, Tanzania. Five of his daughters are circumcised. Amref Health Africa invited him to exchange views with the Maasai elders in Magadi and Loitokitok, Kenya about the Alternative Rite of Passage. As a Traditional Birth Attendant, Sabina Lucas, is a respected member of the Maasai community in Kilindi, Tanzania. Every day she volunteers at the clinic to help mothers give birth. In addition to her work as a Traditional Birth Attendant, Sabina performed circumcision on around 20 girls each year. She has done so for over 30 years. But several years ago she realized the implications of the circumcision for girls. “I was very proud that a girl from my community went to college, but unfortunately she could not escape the harmful traditions of her culture. During and after the circumcision, she lost a lot of blood and eventually she died,” says Sabina. From that moment on Sabina stopped circumcising girls. As one of the first advocates for the abolition of FGM/C in Kilindi, Tanzania, she didn’t have it easy. Many people around her did not understand her choice. Before giving up circumcising girls, Sabina earned around 5,000 Tsh (about $3 CDN) per circumcision. Now that these revenues have fallen away, she has to make a living with the help of her 10 children and her few goats. But Sabina’s faith in the abolition of FGM/C was further enhanced by her visit to Magadi and Loitokitok in Kenya at the invitation of Amref Health Africa. There she saw with her own eyes that the Maasai community accepts the Alternative Rite of Passage. “I’m so happy when I see that Maasai girls go to school and are free to give their opinion. That’s a huge step, “ says Sabina. Nice Nailantei Leng’ete, 26, is a pioneer among women. Nice was Amref Health Africa’s first health activist against FGM/C in 2009 and continues to this day to be one of our biggest champions. 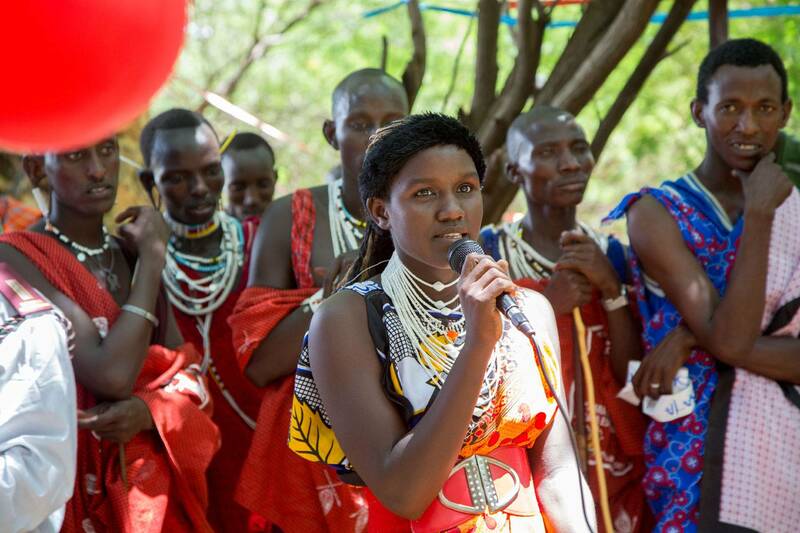 She has spoken to thousands of Maasai girls and women about the health consequences of FGM/C and the crucial need for girls to stay in school so they can obtain an education and broaden their life choices. Nice endured endless difficulties when she began her own personal fight against FGM/C at the tender age of eight. Her courage and passion to help others stands as an inspiration for all of us. VIDEO: Nice talks about how she spoke out against FGM/C at such a young age. WATCH: Nice talks about her experience at TEDx in Amsterdam. Newer Post Stop Female Genital Mutilation (FGM) Start the Alternative!